Posted in Articles by admin. A great interview with Tom Slingsby on his return to dinghy sailing and explaining his training and strategy during his time at the top. Hi, Tom. It’s Colin Gowland phoning from ISA. Okay. Awesome. Hey, thanks a lot for having a chat here. Everyone’s been really excited since you made that announcement on Facebook about coming back into dinghies. Yeah, I’m looking forward to it. Good to just get out there and do some slower but normal sailing again. Right on. I don’t know if you’re aware, but on a daily basis we have a lot of masters and youths coming through and we’re often using you as an example, like old footage from the Perth World’s or Weymouth to illustrate technique. I guess you should just know that you’re still affecting people trying to get better at Laser sailing on a daily basis. Are you going to be hitting up some events now that you’re back in dinghies? Yeah, I’m not too sure, really. The plan is just to get out. I’m just sort of taking it day by day. I’ve got a couple of boats at the club, and, yeah, I’m just going to be getting out in the Finn and the Laser and the Moths, I’m sailing Marstrom 32s, and on the weekend I’m sailing yachts. So the plan is just to get out and sail, and if I get a bit of training in, a bit of sailing in, I’ll consider going and doing a couple of local Australian events. If that goes alright, and I’ve still got time, I might head overseas. I’m just going to play it by ear, but yeah. Everything’s changing in my world. I’m in a bit of limbo with the America’s Cup and stuff, so just waiting and seeing how it all goes. I hear you. Well, it was cool to see your comment saying you were looking forward to “having fun”, because I think sometimes it seems like with the campaigning athletes that come through, and wannabe campaigners, that they oftentimes lose the fun part in the intensity of the training. It’s rumored that you sailed in the heat of your Laser campaigning a lot more than most people, and so I was wondering about if there’s a close link between that importance of having fun even while you’re training hard, and how that kind of links up with the motivation. Yeah. No, for sure. I made sure I sailed other classes, and I was doing a lot of yacht sailing. I’d sail Moths. I’d sail A classes. Even when I was Olympic campaigning, I always tried to keep the enjoyment in the sport. If I sailed Lasers every day and that’s all I did, I would have gone quite stale, I think, and I would have lost a love of the sport, whereas I was moving around a lot, and I did sail yachts, and Moths, and all the other boats. Even the really exciting boats like the Moth or the A class, you still do miss the Laser sailing, how pure it is, how it won’t come down to boat work or boat design, or things like that. It comes down to the ability of the sailor. I think actually, it worked positively for me in a couple of ways in that I kept fresh and I kept enjoying the sport doing all different things, but every time I did do some sailing outside of the Laser, I did miss it. I missed just how pure the class is. Yeah, I can appreciate that. When you go out and train in your Laser, Tom… I guess probably it’s a little different now, I’m not sure, than it was back in your prime, but say… like an intense training day on the water. What does that look like for you? Well, yeah. I haven’t actually been out in the Laser yet. I’ve got to put it together. I’ve been out on the Finn a couple of times, but back when I was sailing an intense day on the water, I saw a lot of people would go out for four or five hours sort of thing. The way myself and the Australian sailing team have always done it is a session may be to three hours… we’d be at it… and everything after that you’re getting… well, I think it’s easy to train bad techniques when you get tired, so that was another reason why I enjoyed my sailing so much. I wasn’t doing five, six hours on the water each day training. I was doing 2.5, 3 hours, sometimes 3.5 hours and the sessions were shorter and sharper. I think you enjoy your training a bit more when you know you’re not going to be out there the whole day. You can get a lot more done, and you really can be specific in your drills. Get on the water and then get off – and then obviously you’re doing training on shore; your fitness stuff and your debriefs etc. You’ve definitely got to keep a good balance, and if you just think that you just go out on the water all day for six hours, that’s not an effective way to use your time. On the water, you get out there with your coach and your sparring partners, do you guys focus on a lot of racing or drills and racing together or? Obviously it’s different each day but can you give us some insight generally speaking? Yeah. Obviously though it’s been a while since I was doing the Olympic training, but I remember we’d go out with a goal for the day. We always say the goal was today to, let’s just say, improve our high mode upwind, to be able to hold tight lanes. So we’d set up a drill where one boat would start ahead with the other one tight on his hip, and he’s got to hold in that position as long as he can to simulate off the start line, or the bottom mark. We’d go out and we’d do that drill quite a bit. We’d usually start with some straight line speed tests and get everyone locked in, and then go into this drill. 95% of the time we would always finish with racing, short course racing, sort of high intensity. That was always fun for people because you come in and you got bragging rights for the day. You beat your mates out there, and then so we always finished with racing no matter what. Sometimes the day was just purely racing focused, and would have a group goal. It’s was just, okay, today it’s short course racing, improving our skills, and then you might have a personal goal inside that. Say, I want to make sure I improve my bottom mark tactical scenarios. I want to pick up a boat at the bottom mark each time through positioning and setup and all that sort of stuff. Yeah, always having a goal, but we always made sure we did a lot of racing. Yeah. It kind of tends to lock in the skill in more of a real life racing situation. Yeah, exactly. It’s like anything. You’ve seen this scenario a hundred times in training… then it’s not a surprise when you get to that in a real race situation. We really believed in that philosophy. About success in a Laser, I have two components here. The first is, I guess if you look at, and you’ve been around the scene for a while, but looking at the mid pack, you know there’s guys and they’re in the 50s, 60s, 70s in ranking, and they’ve been on the scene for years, and years, and they’re working super hard to achieve their dreams in the gym, on the bike, in the water, traveling around and doing the whole singularity of Laser training thing… but a lot of them just can’t break through and get to that top pack. I’m wondering if you noticed that, and what you see then as holding them back and how they could break through… or if you have a bit of story to tell there or any insights. Yeah. Obviously you do see a lot of guys who are sort of … becoming a bit stagnant in their position, and they aren’t breaking into their top group. For me, you’ve got your two different types of people there. First of all, you’ve got guys who really are happy enough being there. They’ve got sponsorship and they can afford to … they’re sort of living their lifestyle. They’ve got enough money to survive from their federation or sponsors or whatever, and they might be 50th in the world, but they’re happy enough doing that. And then you’ve got the guys who are really trying to break into the next level and break into the top 30, 20, 10 in the world. If you’ve ended up locking into 50 or 70th in the world and you’re trying to improve but you’re not really getting any better and it’s been a couple of years, for me it’d just be you got to change your training program. Say “that’s not working”, and you’ve got to mix up the way you set your goals and how you achieve them. You’ve got to change your training group possibly. Travel to a different part of the world and train with a good team…. Yeah…. you do see that quite often, and I often wonder why this guy’s been outside the top 50 for the last four years. He’s paying a lot of money. He’s traveling the world, and personally I think that … I mean, sure your skills might only get you so far, but I think a lot of people just don’t train in the most effective way that helps them. I was always moving up, fortunately, when I was younger, but I did get locked in the 30s in the world for probably a couple of years. I was very fortunate that those were the years when Michael Blackburn had retired. 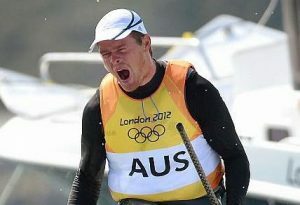 He was an Australian Olympian, and then he made a comeback into sailing and started training with me out of Sydney. Just the ability to be training with him (emphasis). He was top 3 in the world, and just seeing how he trained, seeing how dedicated he was, it really changed my focus, and without him I wouldn’t have … I might not have ever broken through, and I may have left the sport, but just seeing the way he really was dedicated to the sport, it was a real eye-opener for me, and we started training together, and then all of a sudden I came up to his level, and I was very fortunate that he came back into sailing. He was just teaching me that you’ve got to be professional. You’ve got to be disciplined, and if you say you’re going to do something, you do it, whether it’s getting up and going for your morning cycle, getting your leg strength, or you’re going to get up and go to the gym. If you say it’s 1:00 off the dock, it’s 1:00 off the dock. Fortunately for me, I remember at first I took it the wrong way, and I was like, “This guy’s a bit of a prick.” Eventually I realized… well… I was lucky my competitive nature took over and I said, “Okay, I’m going to be there. I’ll be on the water five minutes before that,” and making sure I was. I took the right lessons from it, and all of a sudden I became a lot more dedicated to it and no longer was I just naturally talented but I had this professional work ethic that went with it – that if I said I was going to do something, I was going to do it. That really set me off in the right direction. You’ve got to be disciplined, and if you say you’re going to do something, you do it, whether it’s getting up and going for your morning cycle, getting your leg strength, or you’re going to get up and go to the gym. Nice Tom. I guess from there you pretty much employ the same formula, like all the way up to the top or is there something… you know.. because you have the top group… but then how do you make it to the very pinnacle, you know? What’s the difference there between everyone in the top 10 and then only the one or two guys in a decade that come all the way up to the top? Yeah. I mean, it’s hard to know. I mean, eventually, if everyone’s 100% professional and dedicated and doing all the training, the correct training, and this and that, then it’s really going to come down to natural abilities that you’re born with and, I mean, I got to the top and I think it’s just the striving … You’re not trying to copy someone else’s path. You’re trying to set your own. I remember I was chasing Michael Blackburn for so long, and then I eventually beat him after the trials in 2008, and then I didn’t do well in the Olympics then, but after the Olympics I said, okay, I finally achieved my goal of A, beating Michael Blackburn, and B, I’ve been to the Olympics. I didn’t do well, but then I had to sit down and reassess. Okay, so Michael’s retired. He became my coach, and then I had to set my own goals of, okay, I want to win every world title from now to London. I wanted to be world sailor of the year. I wanted to basically… I said, “I don’t want to lose any events in the Laser anymore”. I mean, obviously, you’ve got to be focused and driven, but at times I think I took that to another level. I remember reading a quote from a guy I admire in Australia…. a surfer named Mick Fanning. I read a book of his and the quote was, “When a man embarks on a mission, he can become impossible to stop.” I remember chatting about that quote with my dad, and it’s interesting. I had got it in my head if that… no one’s ever going to beat me and I’m not going to let anyone. A lot of it comes down to drive that sets you apart from the other guys who are top 5 in the world. I remember I said to myself “I’m never going to let that guy beat me again”, and I would focus so heavily on it. It got me up in the morning. For me, I always had a big rivalry with Paul Goodison, and I remember saying to myself, I’m not going to lose to him anymore. I did lose to him again in certain events, but still just waking up with that drive in the morning of getting up, and you’re going to do the extra bit, or go out cycling in the pouring rain, because I was thinking he’s not going to be out there, so I’ll go in the pouring rain. I’m going to do it. It’s blowing 35 knots. Okay, I’m going sailing because I know he might not be out there sailing. He wouldn’t train in this. I would sort of fixate on certain things. I remember reading a quote from a guy I admire in Australia…. a surfer named Mick Fanning. I read a book of his and the quote was, “When a man embarks on a mission, he can become impossible to stop.” I remember chatting about that quote with my dad, and it’s interesting. I had got it in my head if that… no one’s ever going to beat me and I’m not going to let anyone. A lot of it comes down to drive that sets you apart from the other guys who are top 5 in the world. I remember I spoke to a sport psychologist at the time, and she’s said that’s probably not healthy, fixating on that, but what it did is it got me training harder than anyone and more dedicated than anyone, and I don’t think it really matters what your drive is as long as it’s positive and it gets you doing the right things. I think, all of a sudden after all this training and dedication, I went back on the circuit and realized I was a level above everyone else. Mm-hmm (affirmative), yeah. You’ve got to find your own. You have to find one, but it has to be your own. Like you said, carve your own pathway. Okay. Just moving over to the technical side a little bit. It’s well-known I guess that you’ve had a speed advantage during your top level of Lasering. Also that you have a bit of extra gear in the high wind. Do you believe that to be true and can you describe that extra gear, why, how, what the whole deal is? Yeah, I was definitely fast. Obviously, the higher the windier got, to 20 knots, 25, I was really quick high-end, but really my speed advantage started as soon as you were fully hiking, so you’re comfortably under the foot strap hiking. That’s where I said, okay, now as the wind kicks up, I’m only going to get stronger here. For me, when I got into Lasers and when I was able to race at reasonably high levels, say around the 30s, I was working with a coach Arthur Brett, and we started. Back then it was always looking for height, block to block. The game in a Laser was all about getting height out of the boat. I remember, Arthur Brett and I were training with Brendan Casey from Queensland… we started experimenting a lot more with lower modes, easing sheet and sailing faster modes, and if you’re able to get a good set of waves or you could pump, things like that, you could really go low and get the boat on the plane and then take your height from there slowly, but whilst taking the boat sort of planing upwind, and we developed this technique more and more. We did it outside of racing, just in a small training group, and it got better and better. I think the reason it all started is because of this outside thinking, thinking outside the box. This lower faster mode instead of a higher mode that everyone liked, which we actually got to work quite well… we just developed it and got better and better, and that’s where it all originated from. Then, obviously, we had to keep it hidden, and in the end, I always had others or chase boats watching at that time. At times, I would have 10 chase boats from other countries filming me, watching me, and there were times I would play games with them. There were times we would be serious. I often had a little radio when we were training to my coach Arthur, and he would tell me when someone’s looking, so I didn’t ever have to look back if someone was filming me. I never had to look back. I could just change my technique without them even knowing I had noticed them. Yeah, I mean, I definitely did have a speed advantage. In general, I was a bit bigger than everyone. I like to run around the 83 kilos, 83, 84 compared to the conventional 80 kilos. In the light, obviously you pay a price in the light wind, but to me it was more technique and sailing and finding a little gust in the light winds to make a difference, and in the stronger winds it was oftentimes that you couldn’t beat raw power and speed… that more so making a difference than getting little puffs here and there. That’s why I like to be heavier than everyone. I think the reason it all started is because of this outside thinking, thinking outside the box. This lower faster mode instead of a higher mode that everyone liked, which we actually got to work quite well… we just developed it and got better and better, and that’s where it all originated from. Yeah. It was. It was a confidence thing, as soon as … and it meant you could sail lower risk higher percentage sailing. You didn’t have to start on an end. You could start midline and then know that you’re going to just chip away. You’re going to be quicker than other people. Yeah. I was very glad. It all started back in, I don’t know 2005 or so, and sailing with Brendan Casey and Coach Arthur Brett just developing this technique and it went all the way through to my London Olympics. I still had a speed advantage there. Right on Tom, thanks for sharing all this – our clock has run out but we really appreciate the interview. Good luck to you, and maybe we’ll catch you down in Mexico or another part of the world sometime soon. Yeah, sounds good, thanks Colin.